I am following up my $2 decor post from last week with this $3 decor post. 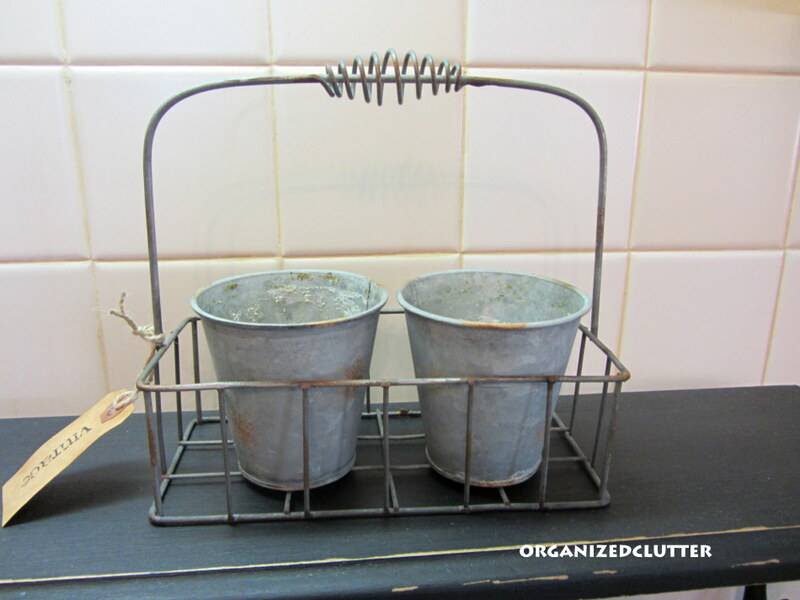 I found these little galvanized pots in a wire basket at my favorite consignment shop, The Second Act for $3. I'm sure they are not valuable or old, just cute. 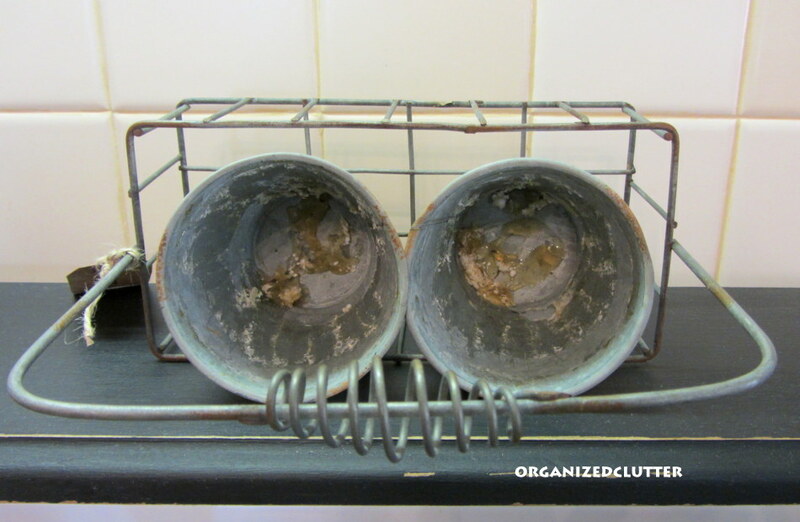 The metal pots contained some faux flowers and foliage that had seen better days. I removed the old flowers that were hot glued inside the pots along with white styrofoam, moss, and a couple of rocks. This was the only tricky part. I tried to melt the glue with my hair dryer and white balls of styrofoam flew everywhere in my bathroom. Bad idea. I then tried rubbing alcohol which was supposed to loosen hot glue according to some internet tips. Not really. The only thing that worked was a soak in a pail of boiling water. I still have a little glue and styrofoam to get out. A couple hedge apples fit in the little buckets perfectly (so no one knows about the glue and styrofoam still inside). I added a tag and a chalkboard that I already had for my $3 decor. Now that was a good buy and you will get a lot use out of those. love them, and you can come up with lots of ways to use them for each season of the year. They are very cute and can be used in so many ways!!! Love them!! They will be fun to decorate with for the different seasons. Love it! Thanks for sharing at the All Star Block Party. 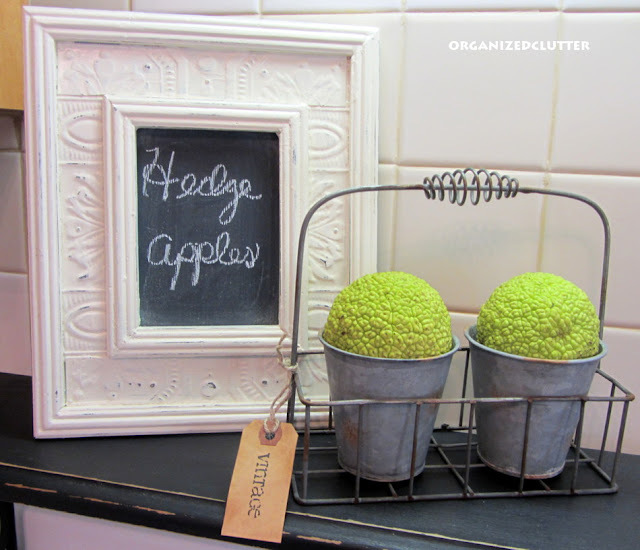 hi Carlene ... just love the basket and buckets with the hedge apples. I plan to copy your decoration. I stopped by this house after Church on Sunday to ask permission to gather some, but no one home. Hedge apples all over the yard and I am sure they would have loved me to pick all of them. I did pick three up out of the street and will go back for more. The little pails are darling with the hedge apples inside! Love the bright green color, even for fall. This is such a sweet set of pails! The set of pails and the carrier are wonderful finds! and you would never know the lovely glue issue was in there. I am always so surprised that people glue stuff into these kinds of things. Thank you for sharing at TTF and have a great weekend! What fantabulous finds! Good eye!